Luisa Barba (Sincrotrone Trieste); Gaetano Campi (Montelibretti Center) CNR Institute of Crystallography, Italy; Ginestra BianconiNorthestern University, Phys Dept. Boston, USA. It is known that the high temperature superconductivity in lamellar copper oxide materials is obtained by material scientists by inserting dopant atoms in the spacer layers intercalated between the superconducting copper oxide layers. The spatial distribution of these dopants at high concentrations has been elusive to available experimental methods and therefore remained unknown for 25 years. The ordering of the dopants imply a reconstruction of the Fermi surface and therefore a relevant information to understanding the superconducting phase. The COMPLEXITY of the structural organization of interstitial atoms was reported only last year by M. Fratini et al. The dynamical ordering of oxygen interstitials was recognized to be relevant for superconductivity by several authors but the main practical problem was the very low mobility of interstitial atoms. 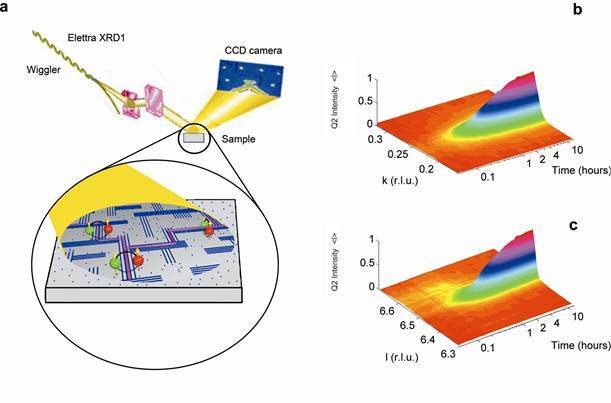 This new work circumvent the problem by using x-ray illumination to stimulate the COMPLEX self organization of the interstitial atoms needed to get HTS. in a reasonable time. In the new paper N. Poccia et al. nature materials, PUBLISHED ONLINE: 21 AUGUST 2011 | DOI: 10.1038/NMAT3088 the international research team reports a different approach to manipulate the complexity of superstripes by manipulation of interstitial defects in the intercalated layers. The first discovery is that the illumination by a high x-ray flux emitted by focused synchrotron radiation beam emitted by the electron storage ring ELETTRA does not induce in this complex material a degradation of the sample, with the standard radiation damage and the formation of defects, but on the contrary the x-ray flux promotes the ordering of the oxygen interstitial ions. These results strongly support that these materials are in an off equilibrium state and it makes their physics similar to the complex physics of photosynthesis in living matter. At this point Poccia et al. show that it is possible to investigate the out-off-equilibrium processes of ordering of dopant atoms (yellow dots) for the first time using statistical physics methods. The process is based on the rapid cooling from the high temperature (above 50 °C) disordered phase to low temperature to get a frozen quenched disordered phase at the starting time, see Figure 1. Figure 1| The disordered quenched phase of oxygen interstitials (i-O) in the rocksalt layers of La2CuO4+y. The i-O ions form a 2D glassy phase. A portion of the crystal made of 10a x 16b Fmmm unit cells with lattice units a=0.5351 nm and b= 0.5418 nm is shown. At this point the investigation of the time evolution of the ordering process of interstitial atoms becomes possible keeping a constant temperature between -50 °C and +30 °C. The process of self organization that will take years in the dark now under x-ray illumination is accelerated and it takes place only in one day. A typical domain made of ordered interstitials (yellow dots) induced by x-ray illumination is shown in Figure 2. Figure 2| The Q2 ordered phase of oxygen interstitials in La2CuO4+y. A portion of the crystal of 11a x 16b Fmmm unit cells is shown. The interstitials i-O ions form stripes running along the crystalline a-axis with a period of 4 lattice units along the b axis i.e. of about 2.2 nanometers. The ordering or annealing process is followed in time by measuring the evolution of the x-ray diffraction reflections due to the patches of ordered domains of oxygen interstitials. The x-ray diffraction reflections probing the in plane ordering of the interstitial atoms in the plane or in the perpendicular direction probing the inter-plane interaction can be see in the spectacular evolution of the two different x-ray reflections as shown in Figure 3. 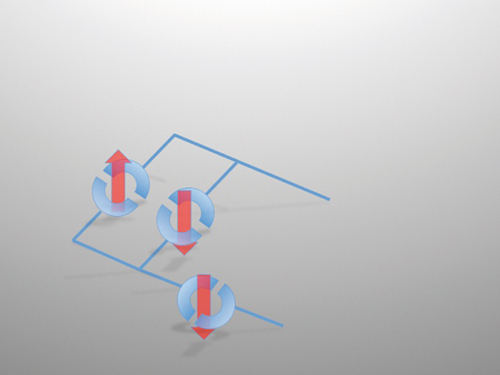 Figure 3| X-ray photoinduced i-O ordering experiment. 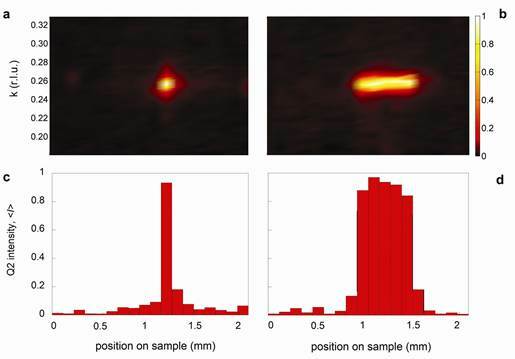 a | The x-ray beam emitted by the Elettra (Trieste) synchrotron radiation facility source is focused on the sample surface at the X-ray diffraction beamline. 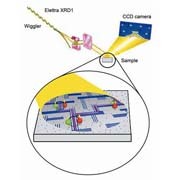 The striped Q2 domains are photo-switched in the illuminated surface layer and a charge-coupled area detector (CCD) records the X-ray reflections from the illuminated sample area probing the dynamical growth of ordered domains of oxygen interstitials (i-O). b | and c | panels show the Q2 peak profiles along the in plane k-direction (panel b) and the out-of-plane l-direction (panel c) growing in time. 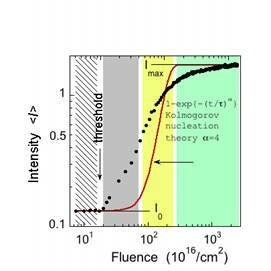 The integrated intensity as a function of time or the fluence of x-rays. The fluence is given by the product of the elapsed time times the constant x-ray flux (the number of photons /(sec x cm2) show clear features of the complexity of the domain growth process. The research group has shown that irradiation of a poor superconductor prepared by rapid quenching results first in the growth of ordered regions, with an enhancement of superconductivity becoming visible only after a waiting time, as it is characteristic for other systems such as ferroelectrics where strain must be accommodated for order to become extended. Figure 4 | The variation of the superconducting critical temperature (upper panel) and the domain growth dynamics as a function of time under constant x-ray photon flux illumination and at fixed temperature 250 K, starting from the quenched disordered i-O phase. There is clear evidence for both 1) a time threshold before i-O ordering process starts and 2) for a lack of saturation of the growing process after 14 hours. 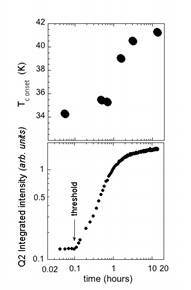 Figure 5| Comparison with the standard Kolmogorov nucleation theory. The fit of the domain growth dynamics of oxygen interstitial ordered domains measured by the time dependent variation of the intensity of the superstructure Q2 reflections <I> using the standard Kolmogorov (or JMAK) nucleation theory with a single parameter (red curve). The result (red curve) is clearly a bad fit of the experimental data. This figure shows clear evidence of the COMPLEXITY of landscape of energy barriers for the ordering process in these systems. The classical theory for the domain growth dynamics for nucleation and crystallisation is the Kolmogorov theory, (named also Johnson-Mehl-Avrami-Kolmogorov, or JMAK equation) fails to explain the unveiled dynamical growth process (see figure 5). The research group has been able to resolve all aspects of the growth of (oxygen) intercalant order, including an extraordinary excursion from low to high and back to low anisotropy of the ordered regions. The authors can also clearly associate the onset of high quality superconductivity with defect ordering in two dimensions. The additional experiments with small beams demonstrate a photoresist-free, single-step strategy for writing functional materials. The disposition of defects in metal oxides is a key attribute exploited for applications from fuel cells and catalysts to superconducting devices and memristors. The most typical defects are mobile oxygen interstitials and oxygen vacancies, and can be manipulated by a variety of thermal protocols as well as optical and dc electric fields. Figure 6| X-ray manipulation of high-Tc superconductors. a,b The formation of a dot and of a stripe of Q2 i-O fractal phase embedded in the disordered phase. the fractal i-O phase is formed in the illuminated portion of the sample surface, as shown in Fig. 1, while in the masked part the i-O are in the disordered phase.. The lower figures show 3D color plots of the XRD Q2 satellite reflection. c,d The integrated intensity is plotted as a function of the position of the beam on sample showing the formation of the 100 mm dot and of the stripe. The dot and the stripe can be easily erased by local increase of the sample temperature above 350 K.
This work opens the possibility to advance our understanding of domain growth in complex new high temperature materials controlled by design, it provides a basis for development of statistical physics of complexity favoring high temperature superconductivity that will be a key step for material design of advanced superconductors and it opens new technological perspectives for the optical design of nano electronic devices. Figure 7| Typical electronic ciurcuit made of planar squids for quantum computing drawn by usign the nanofocused x-ray beam to control dopants self organization.